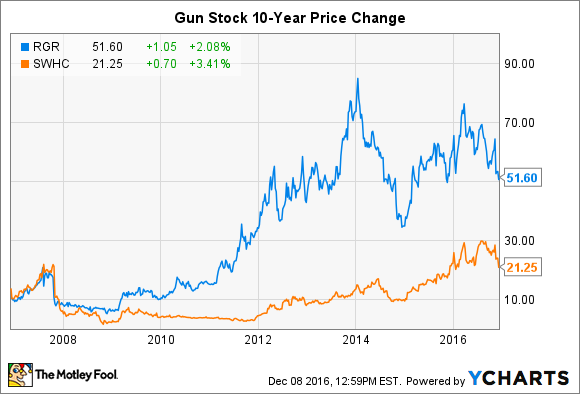 Is Sturm, Ruger's Dividend in Danger? Because of the gunmaker's unusual shareholder payout formula, its current attractive yield could be at risk. Booming gun sales have help Sturm, Ruger's profits grow, boosting its quarterly dividend, but that may now be at risk. Image source: Getty Images. Sturm, Ruger's (NYSE:RGR) dividend is all over the place. Last month, the board of directors set the third-quarter payout at $0.41 per share, almost 14% higher than the dividend a year ago, but 9% lower than the one it paid out for the same period in 2014. In fact, there doesn't seem to be any rhyme or reason to what the gunmaker will pay in any given quarter, and that's for one very good reason: There isn't one. Well, that's not completely true. While most companies pay dividends at a set rate, Ruger fixes its payout as a percentage of its earnings; since 2012, that has been at a rate of approximately 40% of net income. Naturally, the result of that is going to look a lot more chaotic on a fever chart than the average dividend history. Dividends offer investors a steady stream of returns on their investments, and most companies that pay them strive to attract long-term investors with stable or growing distributions over time. Yet there is no one set way to reward investors for taking a stake in a business. For example, precious metals miners like Newmont Mining, Eldorado Gold, and Hecla Mining link their dividends to the prices of gold and silver, while Gold Resources pays its dividend in actual bullion. Egg producer Cal-Maine Foods has a policy similar to Ruger in that it pegs its payout at one-third of the income it produces in a particular quarter, while options and futures trading exchange CME Group sets its dividend at a rate between 50% and 60% of the prior year's cash earnings. Healthcare software systems provider Computer Programs & Systems pays a dividend equal to 70% of the previous quarter's adjusted earnings per share. So Ruger isn't wandering too far afield from the herd with its dividend policy, but that doesn't mean its investors aren't facing a special risk with its shares that exceeds the amount typically present for all dividend investors. After all, there is always the danger any company may slash or even eliminate its payout, though most companies try to avoid that except in the most extreme circumstances. Image source: Flickr via Francisco Anzola. Instead Sturm, Ruger's risk is unique to its business. After years of enjoying record gun sales, many analysts think the firearms industry is heading into an unusually quiet period. Over the past eight years, Ruger's annual revenues tripled to almost $545 million as fears that greater restrictions on gun ownership would be imposed pushed gun sales higher. In that same time frame, Ruger's stock price went from a low of around $4 per share in 2008 to almost $86 a share in January 2014, and today trades just north of $50 a stub. Rival Smith & Wesson Holding (NASDAQ:AOBC) saw firearms sales jump nearly two-and-a-half times in that same period. Its stock similarly went from less than $2 a share eight years ago to $31 this summer, but now trades at around $21 a share. Both stocks have been hurt by the election of Donald Trump to the presidency, based on the belief that the odds of any federal action on gun control have been dramatically reduced, and that will cause sales and thus profits to fall. 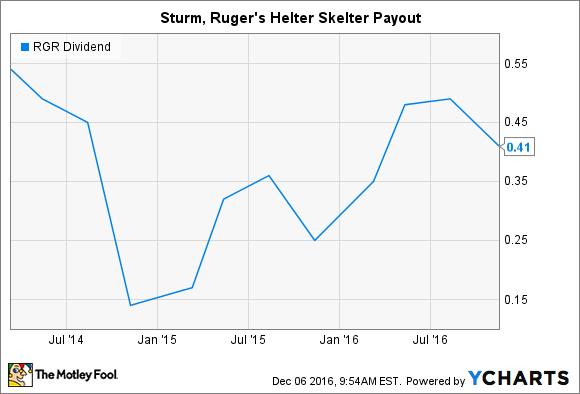 And if that does come to pass, Sturm, Ruger's dividend could be at risk. The gunmaker has a relatively high dividend yield -- currently 3.3%. Although that appears attractive on the surface, because of its variable nature, it will become progressively smaller if profits decline. We saw that happen in 2014 when its dividend contracted sequentially from $0.54 per share in its first quarter that year all the way down to $0.14 per share by the fourth quarter. Fortunately for shareholders, demand rebounded and sales recovered, so that the payout staged a comeback, but if demand is about to fall off a cliff and not to recover for some time, then dividend investors may find their payout expectations from Sturm, Ruger will be shot full of holes.